Happy Valentine's Day everyone. I hope the special person in your life spoiled you today, and is there isn't a special someone then take this MMMMMWWWWWWAAAHHHH - Big kiss from me. 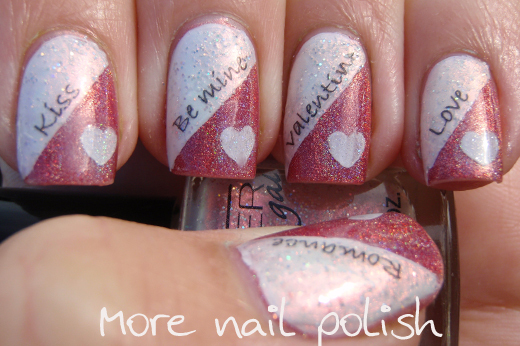 So here is the mani I wore for Valentine's day. Again I used Glitter Gal Copper and White Sparkle because the colours were just so perfect together. I would usually paint the light colour first, then tape it off and apply the darker colour. But because of the glitter in White Sparkle, I knew it wouldn't look very good beneath Copper. Therefore, I had to apply Copper first, then tape off and apply a coat of white polish before doing two coats of White Sparkle. I was very happy with how the taping worked out. Next I applied some home made water decals for the various words. For those that are new followers wondering about the home made water decals, I purchased the "water slide paper" off ebay. 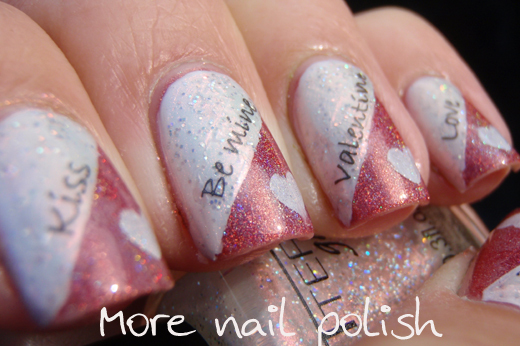 You just print out what you want on your nails, apply a thin coat of top coat so it seals the ink and it wont run in water. Then cut it out and apply it just as you would any other water decal. 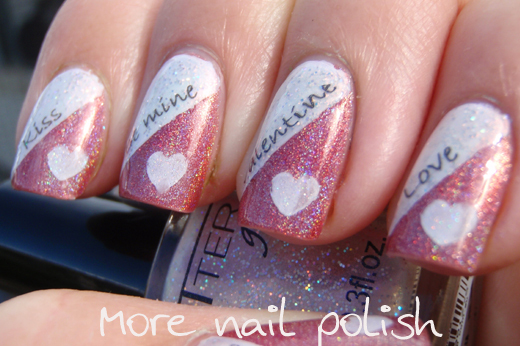 Finally I stamped a single heart on each nail using the large heart out of the set of three heart from the first set bundle monster plates. Unfortunately, zero sun this morning when I photographed this, the glorious sun while I was at work without my camera, then raining as soon as I got home. You will have to trust me when I say how beautifully holo Glitter Gal Copper is. Thanks for visiting again everyone. I love this! 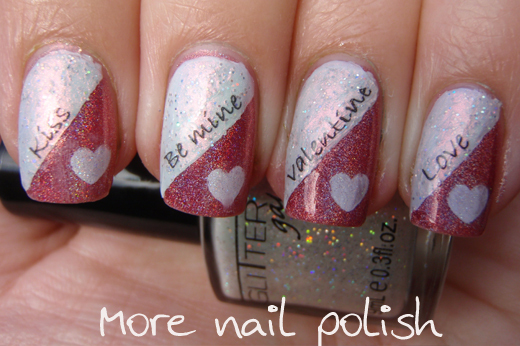 So cute and creative and extra sparkly, so nice! Your penmanship is awesome!! You write beautiful!! That's awesome! I'm so intrigued about the water paper, might just have to try it out. Happy Belated V-Day! Very gorgeous! Love it! I really want to try making my own decals now! I am new to all of this, have always been obsessed with polish but taking it to the next level now. 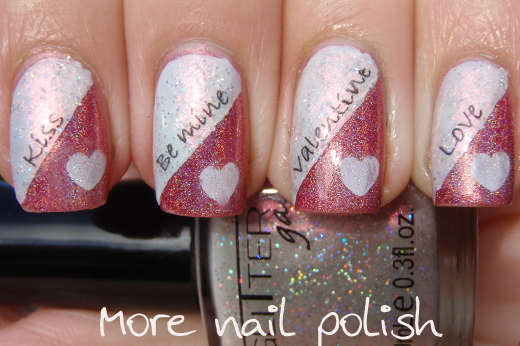 Can you do a tutorial on these water slide paper as I loooove this v day mani so so cute!! !